We were walking down St-Laurent and getting hungrier by the minute. So when madamewoo and I noticed the sign for Soy, we knew we had to stop inside to have dinner. We sat down to an empty house, as we were dining on an early Tuesday, but it quickly filled up. I've heard about Soy before, with its Chinese chef serving up a pan-Asian fusion cuisine. Now I'm not a big fan of fusion food, because it often muddles ingredients and techniques in the quest to stand out and be different. That's not what good food is about. You're not supposed to cook for the sake of novelty, you're supposed to cook good food. We ordered the table d'hôte and sat back to watch a procession of dishes arrive. First came the shrimp chowder, with a thin seafood broth and hints of coconut milk. Not a hearty stew, but rather something to wake up your palate. My favourite little treat came next. Only two 小龍包 came in a bamboo steamer, so we got only got one each. I popped it into my mouth and enjoyed the soup burst out when I bit into it. Divine! 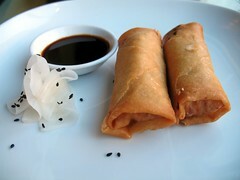 An order of deep-fried spring rolls followed that. They were crispy and golden on the outside, fresh and fragrant within. There wasn't a trace of greasiness, it was done just perfectly. Woo seemed to enjoy these the best, which seemed to be on the menu to appease those who craved fried snacks. 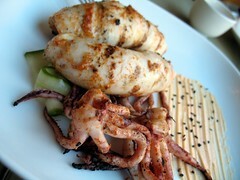 A plate of squid arrived. 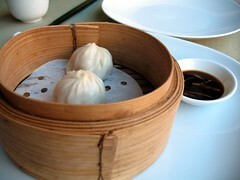 They were marvellously grilled until they were soft and tender, without a hint of chewiness. The red chilli rub they were given matched perfectly with the crispy tentacles. They came with a miso mayonnaise which I found was completely unnecessary. But the bed of pickled cucumber that they rested upon did give a welcome contrast. The mains were served with a large helping of General Tao chicken, grilled shrimps, and beef. The chicken was lightly breaded and very tender. The shrimp, which I preferred, was juicy and crisp. The beef came with some lettuce leaves which were used to wrap these succulent bites. The saucing was a little heavy for my taste, but my dinner companion mopped up the sticky-sour red sauce. For dessert, we enjoyed ice cream atop a roasted banana, still in its peel. A subtle and delicious ending to any meal. To sum up, we had a wonderful dinner with attentive service. It's not very Asian, leaning towards pleasing French-Canadian palates, but it is very well prepared. It is on the pricey side, but the food is worth it. I'd definitely recommend this place for people who want a taste of Asia, but not too much of one. good lord, everything looks amazingly delicious! i must go. but when you say that it's a bit on the pricey side, how pricey do you mean? I think dinner came to about $30 per person, everything included. Lunch is more reasonable, at less than $15. that's excellent! i will definitely try it out. Good plan! Let me know how you like it. I want A TASTE OF ASIA! Isn't my sing-songing "Asia… Asians…" good enough? Sorry...I meant A TASTE OF ASIANS. We are stringy and tough. but not too much of one?! I'll have to try those the next time I go. Sounds marvelous, though I do like my squid to be a bit chewy.